Saturday's run was my first "official" long run for half marathon training and it felt great to get back into the swing of things again! I think long runs are best to do in the morning, before the day heats up and I'm worn out, but some days it just doesn't happen. After mowing the lawn and a little gardening, it was long run time (and the boys' nap time). Hot, sweaty and tired... I made it! On some long runs I listen to podcasts, other times it's music or nothing at all. Getting back into long runs feels like a special occasion. I listened to music for 60 minutes straight! I love my boys but it felt good to "run away" (literally) for a little bit. 1. Run Wild - For King & Country. Of course it's #1 because the word "run" is in the title! 7/13 M - 2.06 easy/recovery miles, 20:01 @ 9:43/mile. Worn out after Saturday's race! 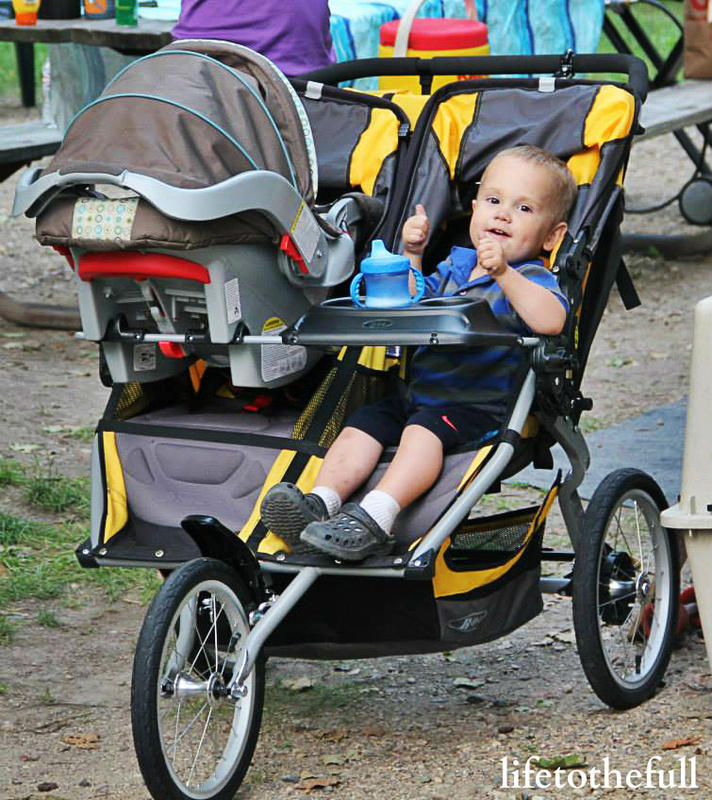 7/14 T - 1.75 miles with the double stroller. Planks for strength training. 7/15 W - 3.06 treadmill miles, 27:01 @ 8:49/mile. Was supposed to be a 45 minute tempo run but Baby W was super fussy during big bro's naptime. 7/16 H - Strength Training. 7/17 F - 3.06 easy miles, 30:39 @ 10:00/mile. Tired but it felt good to get outside for a run. 7/18 S - 6.78 miles, 1:00 @ 8:52/mile. Miles 1-4 on pavement, 4+ on gravel. I was tired before the run even started! My pre-run "warm up" included mowing the lawn and harvesting peas from our garden. Then it was time for 60 minutes of running. What's random songs are on your favorite playlist? I love reading "day in the life" posts and so much has changed since I shared my last one almost a year ago. I'm now a mom of TWO! E is 28 months old and Baby W is 2 months old. While we have a general "routine", each day takes on a shape of it's own. Baby W's schedule is still quite unpredictable! This is just one of our days last week where I took the time to write down the things we did. Most days feel like such a blur I can't remember what I made for lunch. 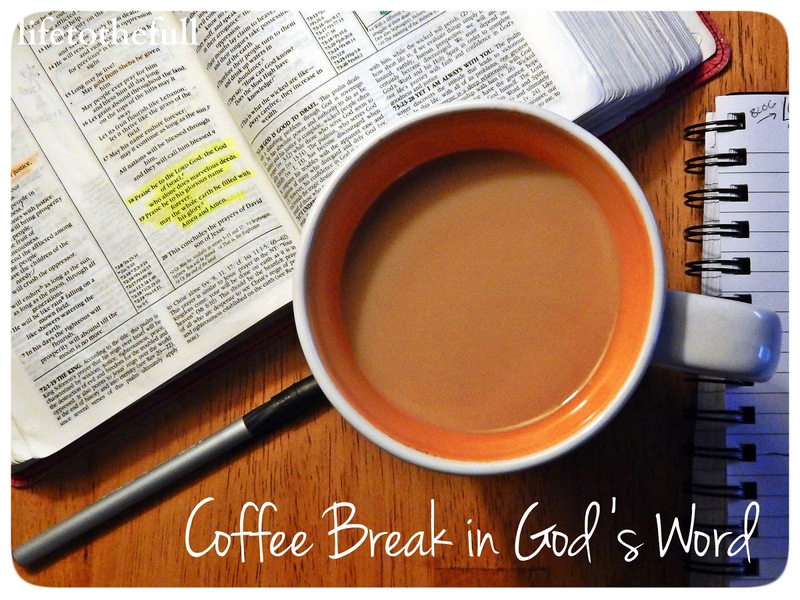 Writing down your day - just one day - is something I recommend for everyone to try! Knowing how you spend your time may help with more effective time management. It was a little disheartening to see how much I didn't get done on the "to-do list" yet rewarding to look back on all the memories being made. Plus, for once I would have an answer to the "What do you do all day?!" question. This post contains affiliate links. 5:30AM - Might as well start my day. I burp W and grab a granola bar from the kitchen. I read through the She Reads Truth devotional for today on Leo's smart phone and spend time in prayer. After my morning devos, it's time to get the running clothes on. It's a rainy morning so I throw on my waterproof Boston coat and head out the door. 6:50AM - That was my first run without walk intervals since Baby W was born! I feel more tired than I expected yet it feels good to "accomplish" something for the morning - since I'm not good at the whole sleeping thing. After a very quick cool down walk and stretch, I come into the house and find that the chaos is starting to brew - everyone is awake! Off with the sweaty clothes and into the shower I go. 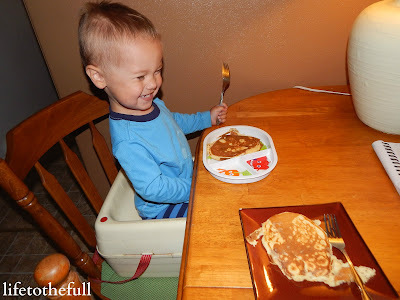 7:30AM - Leo made pancakes this morning! On rainy days, he doesn't start work until 8:00 am. Today was a treat! As soon as I got my pancakes, Baby W must have smelled them because he needed to nurse. 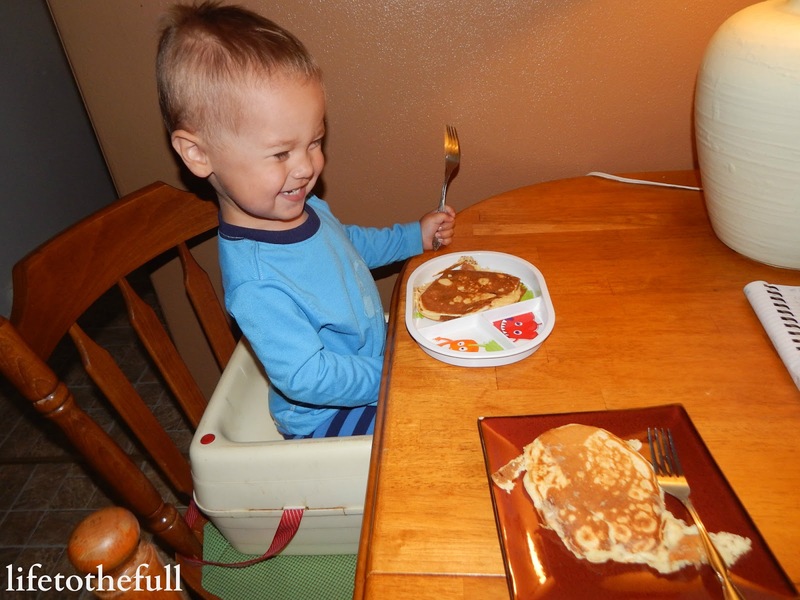 E looks excited about the pancakes but don't be fooled. That stinker only ate like one bite of his. Daddy leaves for work. I clean up the breakfast dishes and we go through the boys' devotional book, "The Baby Bible Storybook for Boys ". 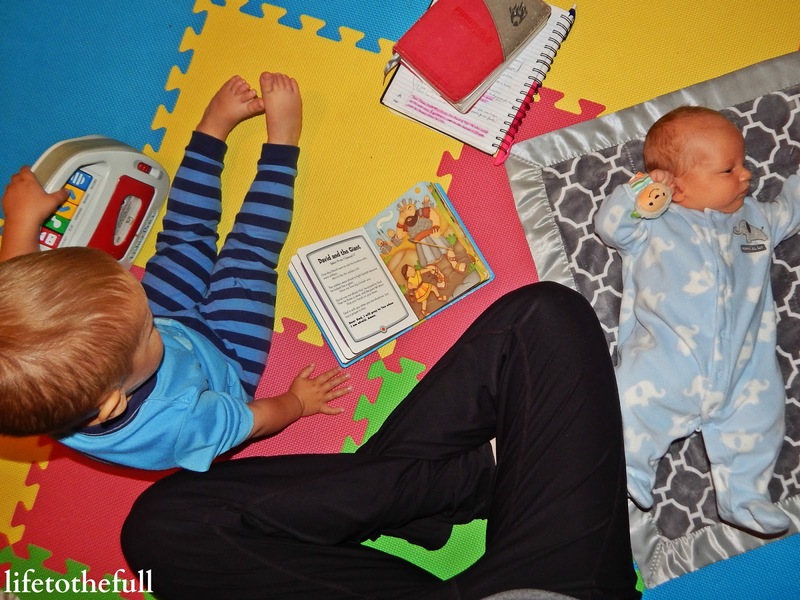 After some "David & Goliath", we read a few more books together. I love our time spent reading because it means I can drink my coffee while sitting down! 9:00AM - Time for dishes. We don't have a dishwasher so this takes a little while some days. Today was one of those days. I started off doing the one-legged dishes, while rocking the baby in his car seat with my other leg. He was having a fussy/gassy morning! Baby W started crying which made E start crying, telling his brother to "Stop it!". Now seemed like a good time to boil some eggs for egg salad at lunch time. I took a break to nurse Baby W while I bounced E on my legs as he "rode horsey". After giving up on burping W, I finished dishes. Whew! We brush our teeth (forgot to do that earlier) and change W's diaper. 10:15AM - This is our usual park, play date or outside time. 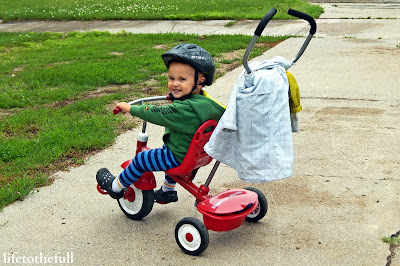 Today we prepare to venture outside for some trike practice. 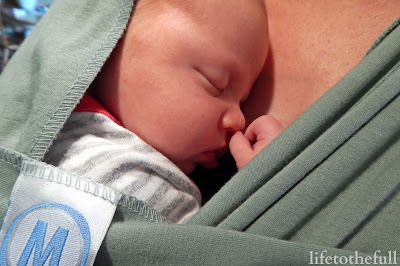 I help E get dressed, change W's outfit and fumble over putting the Moby Wrap on myself. 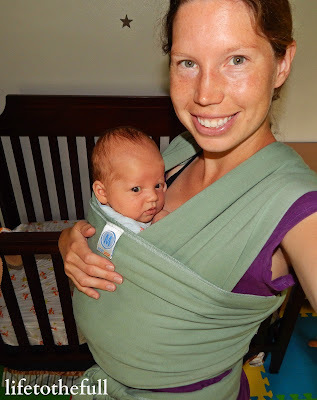 I place W in the Moby Wrap and we all head outside for trike ride and walk. E hops on his trike and we are ready to go. We brought our rain coats with just in case it decided to downpour again. 11:00AM - An urgent potty break brings us back in the house. Afterwards, E face plants in our hallway. I kiss the boo boo and we pick up the toys that flew everywhere. I finish up the egg salad and fry some bacon. Egg salad and bacon are perfect for each other! We eat lunch right after it's done. W continues his nap while I have some alone time to play puzzles with E.
12:15PM - Daddy comes home for lunch. W wakes up and it's time to nurse. Daddy and E rough house after lunch. 1:00PM - Daddy leaves for work and E goes down for his nap. It's mommy and Baby W time! He naps on me while I edit pictures from a friend's wedding reception that happened a month ago... I still need to finish those! This is the time when I would sneak in a treadmill run or strength train if I didn't workout in the morning. 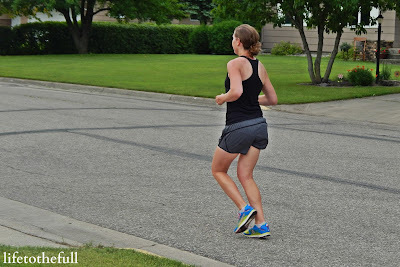 Since I ran early this morning, I edit a couple pictures and reply to a few comments on the blog instead. 2:30PM - Nurse W. Laundry time! Throw cloth diapers in for wash #1. Lay down for a rest with Baby W. Usually when I'm ready to rest, W is ready to play. Today I caught his smile with my phone's (not very good) camera! 4:00PM - I hear E's door crack open. He's up! Baby W nurses again and we all get ready for more outside time. 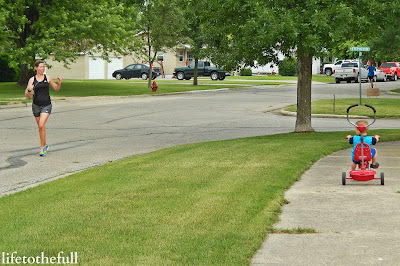 E rides his trike around the front yard but we stay close to home while a thunderstorm passes by just north of us. Baby W loves being in the Moby Wrap ! He has been in a growth spurt lately and all of the cluster feeding has left him extra gassy... and fussy. The upright position and movement helps him work it out. 5:30PM - We're back inside and I start supper. I nurse Baby W and Leo comes home from work soon after the food is done. 7:00PM - After supper and some rough-house playtime, I cut Leo and E's hair. This is a monthly sort of thing for Leo's other job and E wants to do whatever Daddy does! After haircuts, the bedtime routine begins. I throw the cloth diapers in for wash #2. 8:00PM - E is down for bed and Baby W continues to cluster feed. I hang the cloth diapers to dry downstairs, clean up after supper and feed the dog. Leo and I sit down to watch a Netflix show together - we are hooked on Parenthood! - and Baby W nurses. 9:30PM - After getting ready for bed, I pass out after the show to get some sleep before Baby W wakes to nurse again (at 1:00 am) and Leo works on paperwork. Overall, being a mom of two isn't as bad as I thought it would be! I'm tired and the days feel long but they are filled with so much joy. My husband and I thank God for these two sweet boys and it's such a blessing to spend my days with them! Do you prefer a regular routine or an unpredictable, let's say "spontaneous" day? The night before the race was rather sleepless. It wasn't that I was nervous or feeling restless. It's just this very hungry baby boy loves to spend quality time with mom in the middle of the night. Good thing he's so cute because his little smirk makes the sleep deprivation worth it! After Baby W's last nursing session, 6:00 am came quickly. I jumped out of bed to brew my coffee and make a batch of egg pancakes before E woke up. My mom (a.k.a. "Grandma") stayed over night and was ready to watch the boys for me during the race, as Leo was gone for the weekend. Baby W was fussing but he calmed down quickly after some cuddle time with Grandma. 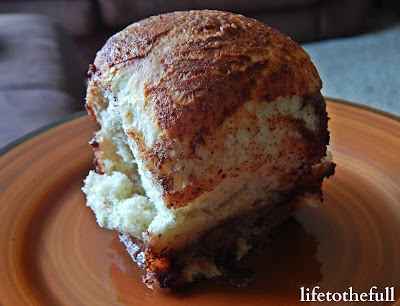 While waiting for the egg pancakes to get done, I sipped on my coffee and rolled out my legs with the GoFit massage bar. This was my attempt to appear well rested and fresh-legged for the morning's 5k. As soon as E woke up, we all ate breakfast and got ready for the morning. After nursing Baby W again, he was due for a diaper change and I dressed him in his day clothes. It was time for me to leave for the race soon so I pumped and prepped a bottle for Baby W.
I put on my Garmin and iPod, grabbed a bottle of water and my entry fee and headed out the door. The morning temp had already warmed up to 73° and the air felt thick at 83% humidity. Best part about this race? I could walk from my house to the starting line! I did a mix of jogging and walking on the way there and registration went really quick, as it was a small-ish local 5k. After waiting around for 30 minutes, we lined up on the starting line and were off at the blow of a whistle! 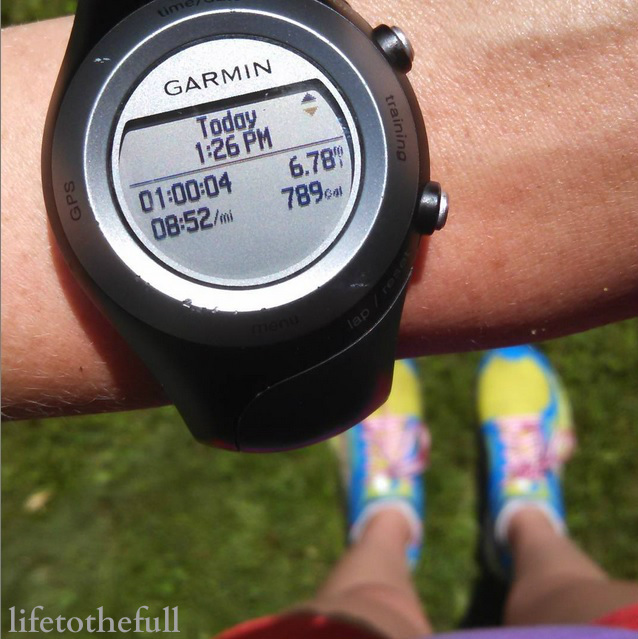 At 7 weeks postpartum, my plan was to take it easy and run at a pace hopefully under 9:00 minutes/mile. That plan flew out the window! There were two very speedy women in front of me and my competitive side couldn't help but chase them. 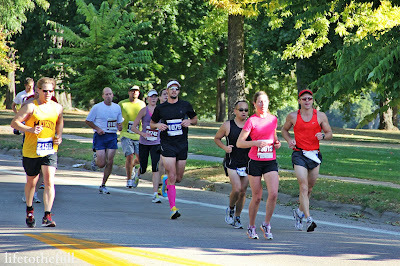 One of my first postpartum race goals was to ignore my Garmin during the race... but I had to look. 7:19?! I knew I was running at a pace that would be hard to maintain at my current fitness level. My legs felt strong but my lungs reminded me that I haven't done any speed work or tempo runs in a long time. I carried on the huffing and puffing but slowed my pace slightly to a little under 8:00/mile. Just when I was thinking, "Ah, this is why I don't like 5k's!" I saw a very cute little dude riding his tricycle down the sidewalk. E even blew me a kiss! 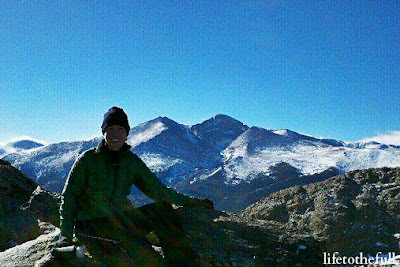 Grandma and the boys were cheering me on and that adrenaline boost helped me to ignore my fatigue. I ran past them one more time as we completed the loop on the course and I blew E one more kiss. To keep my legs moving, I kept thinking "Cadence, cadence! Get those feet moving!". 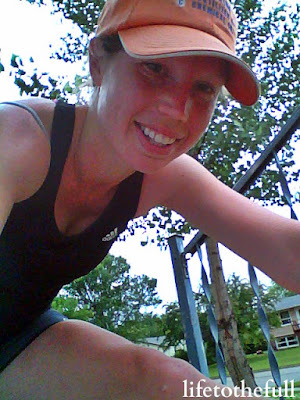 I didn't need to run fast but I wanted to keep a quick cadence as good practice for upcoming longer distance races. Something I really like about this race is that I know the course well. It's rare for me to know the course I'm racing on and it was encouraging to know the finish line was near. I could keep this pace going for just a little longer! I ran home to Grandma and my boys and we were all ready to head inside to the air conditioning. After a quick shower, lunch and the boys' nap time, we were ready for the parade festivities! We headed to the parade and got way too much candy. E is my candy magnet! Everyone threw candy to him. Grandma held Baby W while we picked candy. E became a pro at parade candy picking this year! When we got back home, we were all exhausted and in need of a cool down. After supper, we watched Piglet's Big Movie and called it a night. 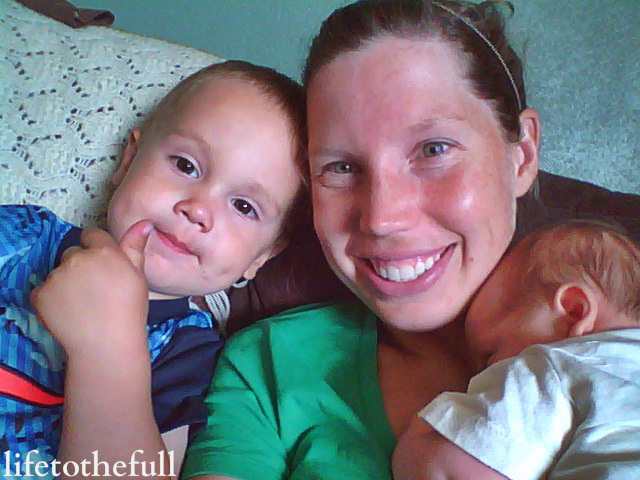 I love cuddling with these boys! 7/6 M - 3.1 treadmill miles, 30:00. 1 min. walk/4 min. run intervals @ 9:00/mile. 7/8 W - 4.25 miles, 40:02. First day of no walk intervals! @ 9:26/mile. 7/9 H - 2.23 treadmill miles, 20:00 @ 8:58/mile. 7/10 F - Rest Day. 7/11 S - Sizzler 5k. 3.14 miles, 23:53 @ 7:36/mile. Happy Fitness Friday! 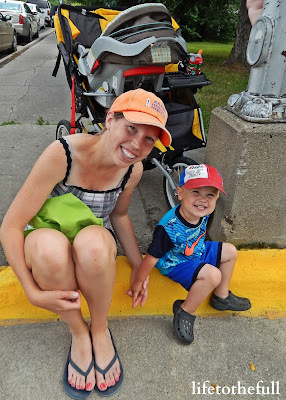 Tomorrow I'm running my first race since Baby W's birth and I wanted to share a few of my race goals with you. Over the past three weeks, I have been doing walk-run intervals to ease into running and I had my first "running-only" run on Wednesday. I'm not ready to push the pace but I do look forward to running with other people tomorrow! I run alone these days and really miss the running group atmosphere from our old hometown. 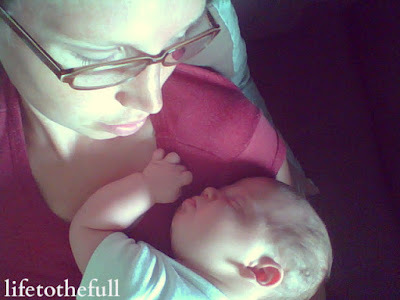 Pregnancy, birth and the postpartum recovery take your body through so many changes! This week's 4-miler this week was a good reminder of all my body has been through. The 9:25/mile pace smoked me at the end of the run. 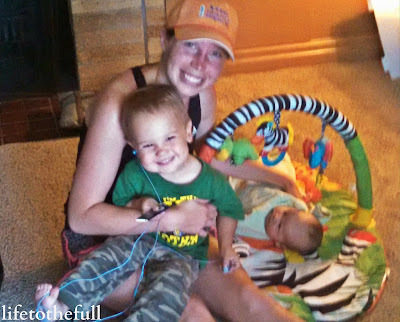 That workout was a reminder that it takes time and patience to rebuild fitness after having a baby. Consistent stretching and foam rolling helps me to recover between workouts as I gradually increase the mileage and pace. As well as running by feel, I am focusing on keeping my cadence at 180 steps per minute or higher. 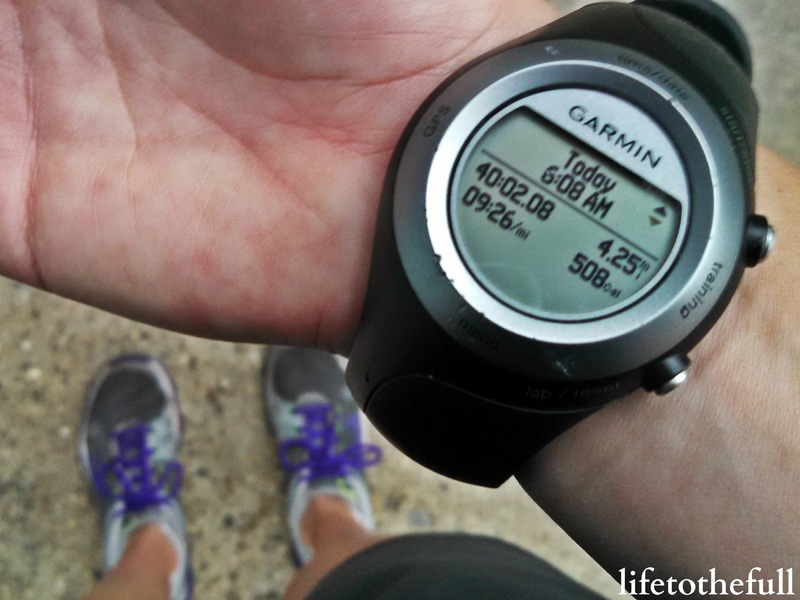 If you haven't counted your cadence before, check out this article for more information. Black is a great color option for tops because it won't show leakage if you are a nursing mom and, well, you spring a leak! Wearing at least two sports bras is another great tip for breastfeeding moms. Anything to save some race day awkwardness. Ha! Just kidding. Sleep's not really happening, at least for me and Baby W. If your 2-month-old is sleeping through the night already, please don't tell me about it! I might cry. A full night's sleep seems far away at this point but foam rolling the night before and a cup of coffee on race morning will get me moving. I want to make the best of this running solo experience and not feel guilty for asking help. I really struggle with this but I know Grandma needs some bonding time with her boys and being alone for 30 minutes will be good for me. 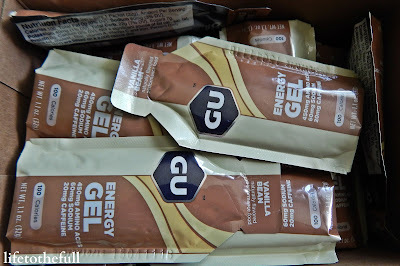 This has also been my first training week for the Wild Hog Half Marathon in September! Next week I will start the weekly WH1/2 training log posts as I ease into running longer distances again. What are your racing plans for this year? How did you ease into running again after having a baby or being injured? 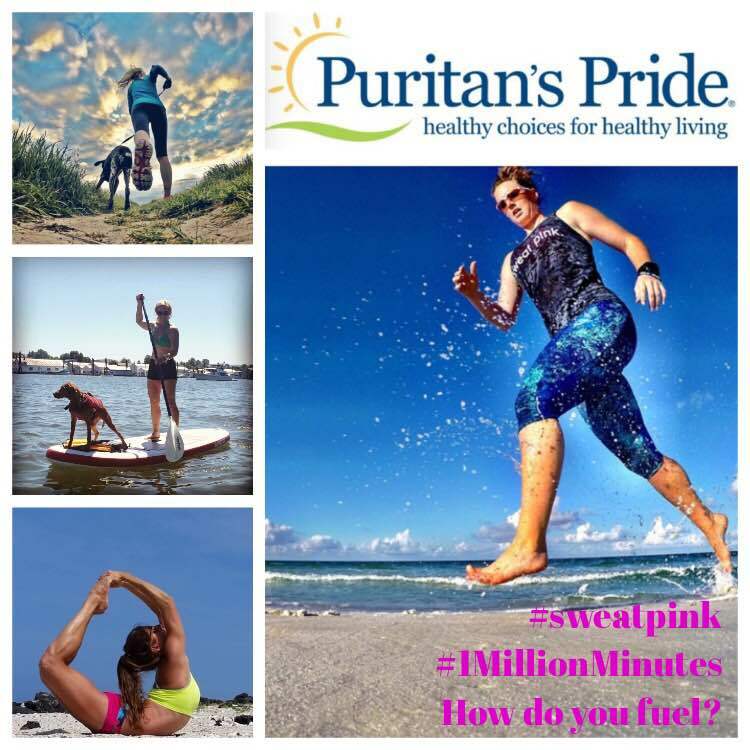 I’m so excited to fuel my #1MillionMinutes goals with Puritan’s Pride! All summer I plan to run my way to a healthier, fitter me, and I’ll need help staying hydrated and fueled during all my family and fitness adventures! I will make sure I stay on track and will rely on healthy snack options to keep me well fueled before, during and after workouts, and my trusty water bottle to keep me hydrated! I’m most excited to try the Kind Peanut Butter Dark Chocolate + Protein bars and Crunchy Cashew Clusters from Puritan’s Pride because they look absolutely delicious. One supplement I’ve never tried but am curious about is the Muscle Milk® Chocolate protein powder. I think it might make me extra recovered after hard workouts. 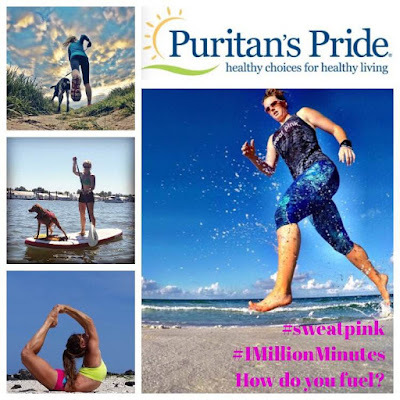 This post is sponsored by Puritan’s Pride. All opinions are my own. We so appreciate you supporting the brands who support Fit Approach and the #sweatpink community!